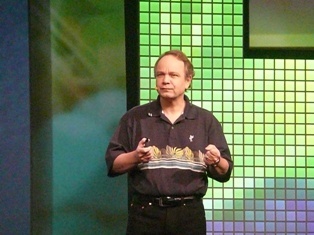 The keynote for this year's GDC is game design legend, Sid Meier and he tells us that everything we know about game design is wrong. 10:31 Game design is a pyschological experience. 10:34 If you play Civ you are an egomaniac. 10:37 If you give something to the player, they won't question it and they'll believe it was because of their clever strategy. If something bad happens to the player, the game is broken and something is wrong. 10:40 Unholy Alliance is a term that I want to trademark. I missed uncanny valley. The unholy alliance is an agreement between the player and the game designer. The player is the star of the game and keeping them feeling good about themselves is the designer's responsibility. In return, the player promises to suspend his disbelief. 10:46 It's more satisfying to win against a bad and cranky Ghengis Khan, rather than one that cries for mercy for the women and children. For some games, it's important to remove the moral dilemma and provide moral clarity. 10:49 Style is a part of the Unholy Alliance. A game that starts out happy and cartoony, and then all of these horrible things starts to happen, it pulls them out of the game. 10:52 Meier told a story about how one player said that the odds of the battles in Civ felt off to him. The odds said the player had a 3 to 1 chance to win and he lost, which felt wrong because 3 is such a bigger number than 1. "How could I lose? I've got a 3!" Player psychology can be counterintuitive to mathematics and probability. 10:58 Civilization started out as a real time strategy game, but the player was too much of an observer. Like SimCity. As soon as it was a turn-based game, the player was the star. 11:00 Random events need to be treated very carefully because the player can have the worst and most paranoid response. If something awful happens to him, it can make him feel like the game is broken and unfun. 11:04 Facebook game, Civilization Network: Meier thought it would be cool to be able to allow players to give gold to each other. But that never happened in playtesting. 11:05 Use the player's imagination. Save money by letting players imagine elements without creating assets. Example: Civ Rev popup tells us that the sultan of zanzibar wants to curry favor with us by giving a caracvan with dancing bears. In truth, there was no dancing bear animation, but the player didn't need to see it in order to get the image. 11:09 Players project onto the AI because of the competitive nature of the game. 11:10 AI should not act like another player. When you play another person, you expect tricky manuevers and clever play. But if the AI does that same behavior, the player believes that it's either dumb or cheating. 11:12 The more that the AI provides feedback and the other leaders react to what your doing [in Civ], the more the player feels that they are in a living breathing world. 11:14 Meier has seen people play Civ where they save before each battle and reload it if they don't win. "That's not the game that I designed." So it's important to limit the accessibility to loading and saving. In Pirates!, you can only load and save in ports and that is a great way to add it to the story of the game. 11:19 Listen to the player. Don't take what they are saying literally. They will often offer solutions, but that feedback often doesn't take into account how it may break other parts of the game, etc. But it's still important to look at the motivation for what that feedback comes from. 11:21 Wrap it up for you guys with the idea of the Epic Journey. I think I want to trademark this as well. I come back again and again to interesting decisions. By giving the player as many choices as possible, ones that can have far-reaching impact, is a way to get them to feel that they are on an epic journey. 11:23 Shoutout to World of Warcraft as a game that effectively shows progress with leveling system. It's important for the player to feel that they've accomplished something in the last hour or half hour. 11:25 By doing all of these things, you can create an epic journey for your players. 11:26 And now, you know everything. Time for questions, anybody have anything you want me to ask Sid Meier?